Charles Hufford helped acquire new NMR spectrometers for the pharmacy school. OXFORD, Miss. 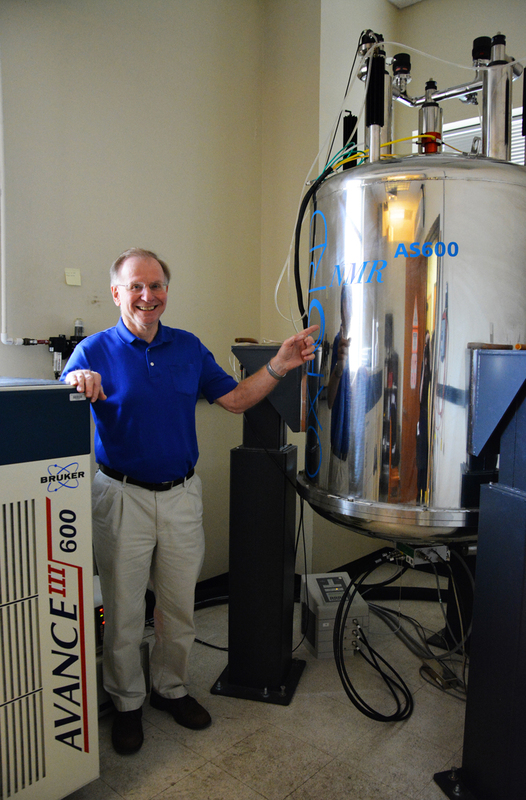 – Known worldwide for its excellence in drug-discovery research, the University of Mississippi School of Pharmacy is installing three new nuclear magnetic resonance spectrometers to complete a suite of eight and enhance its research capabilities. The school upgraded its 600-megahertz machine in December. A 500-MHz machine and two 400-MHz machines were delivered in January to be installed in upcoming months. An additional four machines reside in various areas of the school. Hufford facilitated the purchase of the new and updated equipment, which cost roughly $1.5 million in federal funds. The funds were approved as part of the recent construction of Thad Cochran Research Center West under Grant No. C76HF10917 from the U.S. Department of Health and Human Services. The school has decades of experience with NMRs, having purchased its first proton-only machine in 1969. Multiple upgrades have occurred over the years, including the purchase of a superconducting 2D-NMR in 1985 and the addition of three new machines in 1995 when Thad Cochran Research Center East was built. Maintenance, or “care and feeding,” of the machines is time-consuming, Hufford said. Most of the work involves keeping them full of liquid nitrogen and helium. These liquids allow the machines’ superconducting magnets to function properly. Frank Wiggers, principal research and development spectroscopist, is largely responsible for these tasks. The machines will further help the school’s researchers by allowing them more time in general to conduct spectroscopy. It is unique for a pharmacy school to own eight NMR spectrometers, Hufford said.